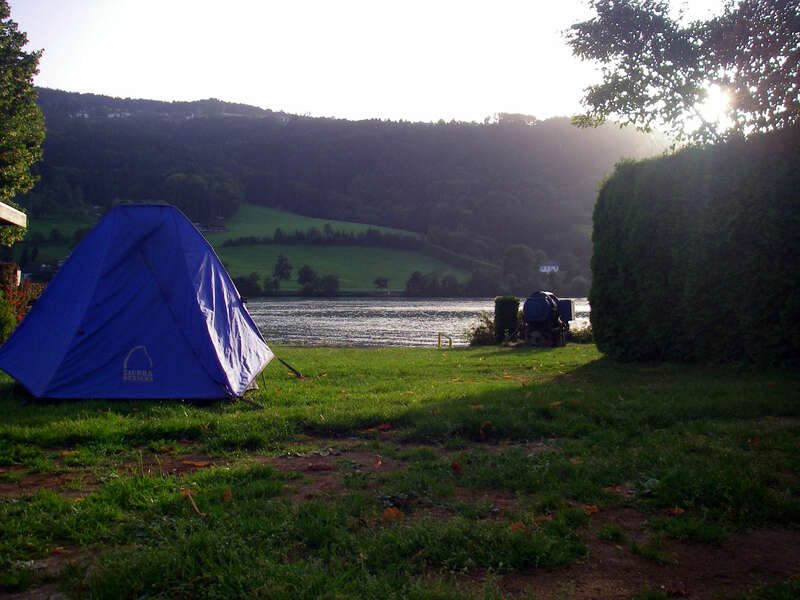 We left the campsite around 7.30 am. 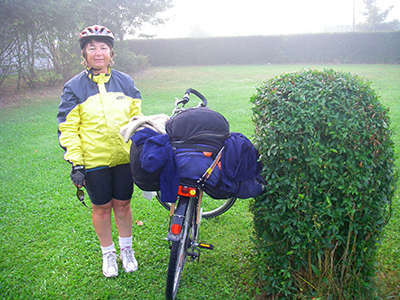 It was very foggy and quite cool although not cold enough for the leg warmers yet. Usually at home a foggy morning indicates a fine day afterwards so we were optimistic. Our washing was still wet so we resorted to drying them on the packs as we rode. The riding was quite easy along a good cyclepath on the left bank of the river. 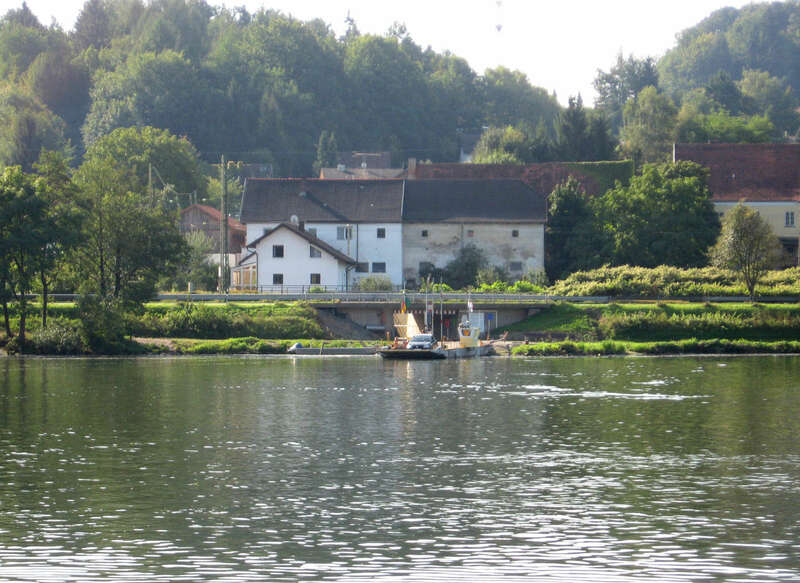 We could see industrial buildings on the other bank as we passed. 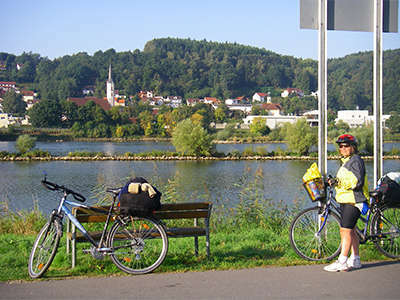 We bought supplies at an Edeka in Hofkirchen and continued riding away from the river and then back to it near Hilgartsberg. 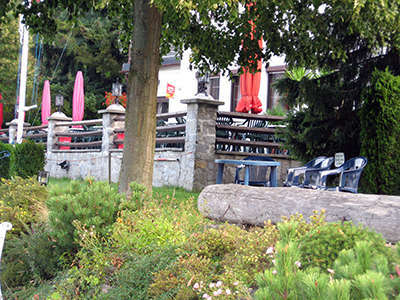 From here the track ran alongside the river and we looked for a place to have breakfast looking over the river. 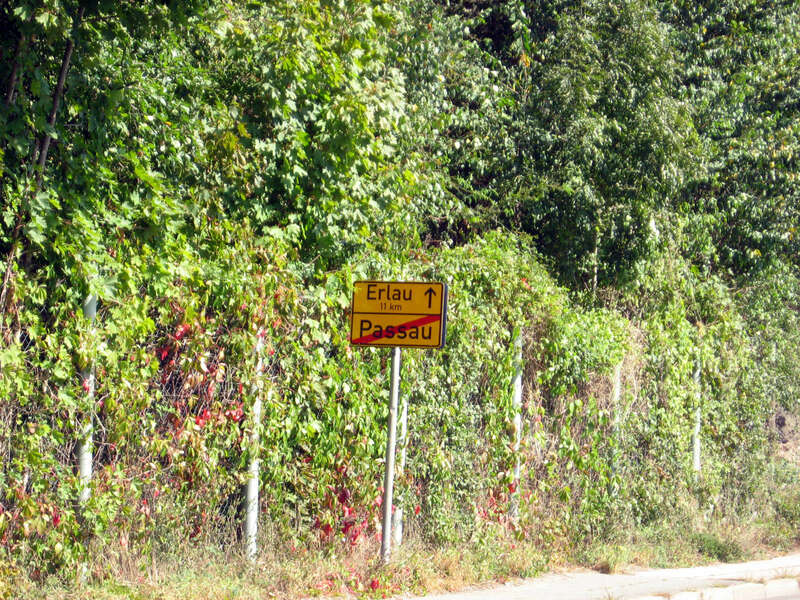 We stopped near the 2250 km sign. This was the distance to the Black Sea. All packed up ready to start at 7:30 am, with Maria standing beside my bike, which was laden with socks and clothes to dry along the way. This worked well. A spider web, the first I had seen. There are remarkably few insects and other invertebrates in Europe, and almost no birds. I found this quite disconcerting. Birds have been trapped for food for thousands of years here, and the population has been severely depleted in recent years by ever more sophisticated methods of catching them. 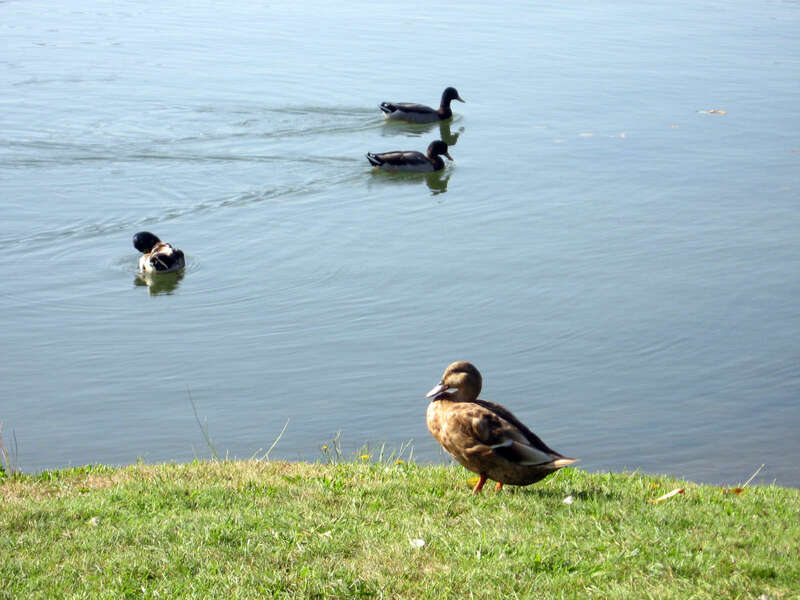 All across Europe bird populations are in steep decline, and the slaughter in the Mediterranean is one of the causes. 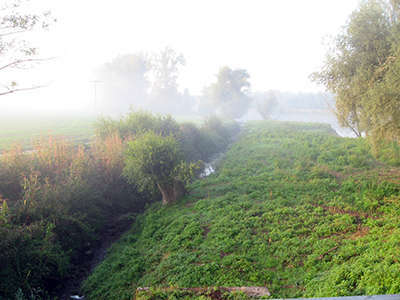 Early morning fog, as a little stream enters the Donau, past a pollarded Willow tree. This looked like a gas powered electricity plant. 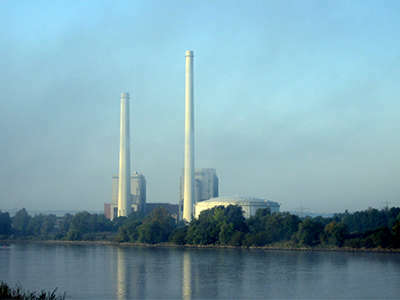 We could not see any smoke from the tall chimneys. We always chose the track on the levee bank for preference, since it was guaranteed to be level. 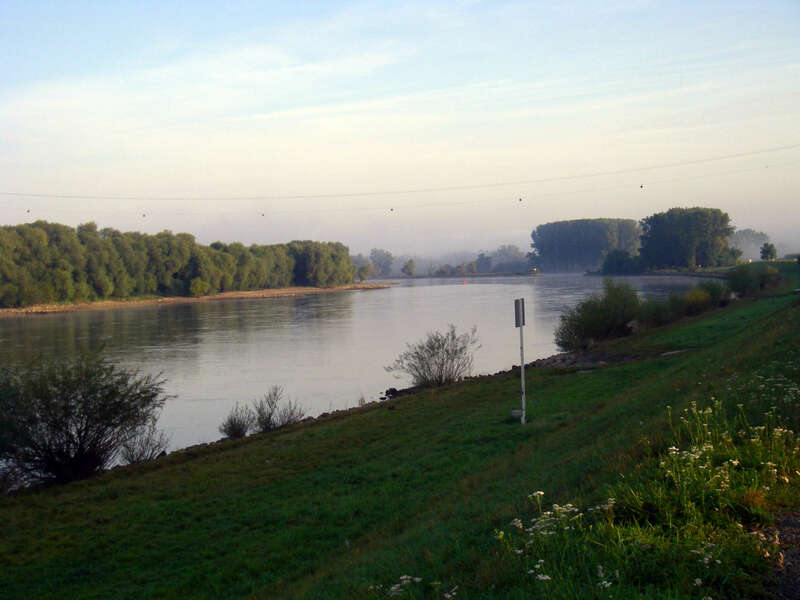 Early morning over the Donau. The electricity power lines have a line of spheres strung below them in order to warn shipping of the danger of high voltage lines. 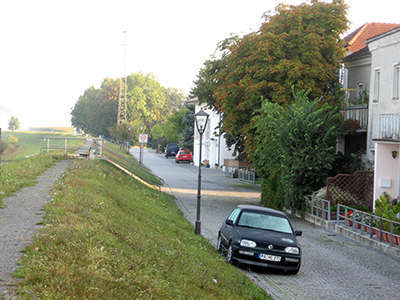 German farm layout is quite different to Australia. 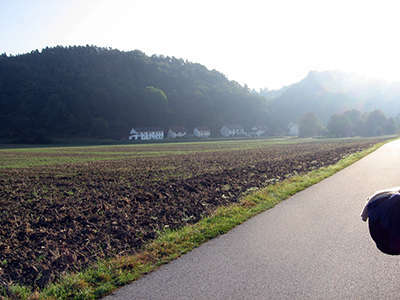 There are often no road verges at all, the crops come right up to the road. In Australia there would be wire fences to keep animals such as sheep and cattle in, and also to keep travelling stock out, and a wide verge at the side of the road between the fence and the road for feed. Here there are no travelling stock, and no need for road verges with grass for them to eat as they go from one place to another, so unless there are animals to be kept in with fences, the ploughed area comes right to the bitumen. 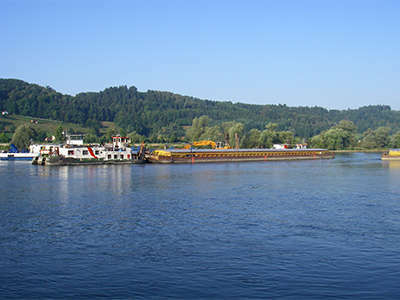 The barges kept coming, the Donau is a major thoroughfare for the transport of heavy goods. The front end loader partly obscured by the passing barge is there to load material onto the boats. 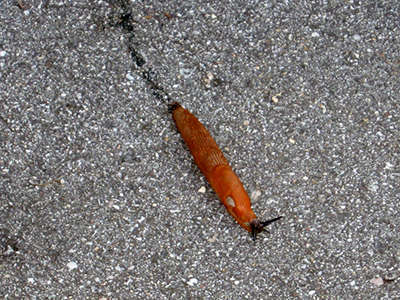 Along the track we ran over many giant slugs which we'd seen almost every day on the radweg. 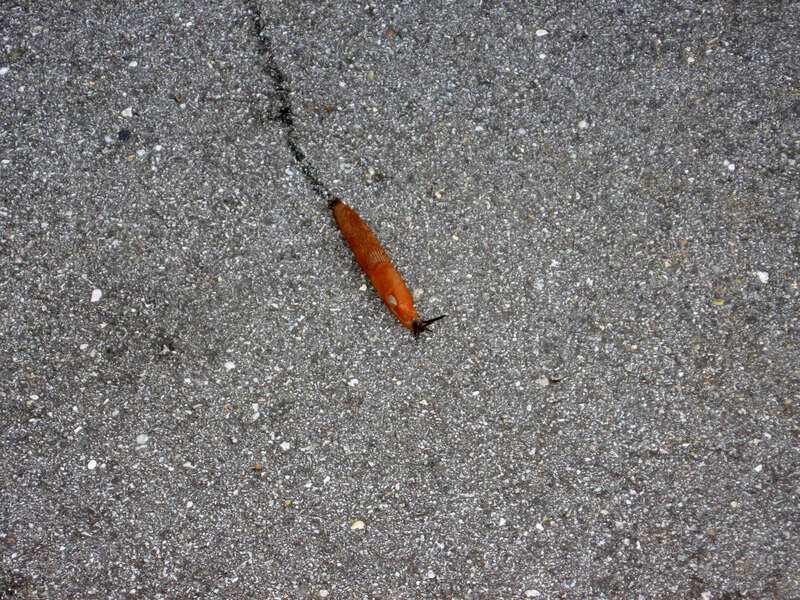 They come out of the grass and cross the track. On some days we'd even seen a few small grass snakes which moved extremely quickly to get out of the way. 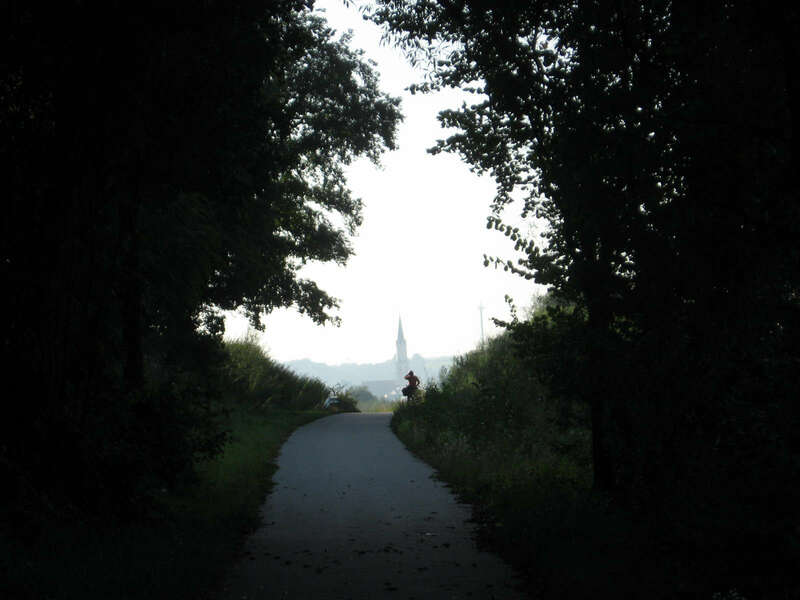 Maria took this beautiful shot looking from the forest to the city. Vilshofen an der Donau was ahead, across the other side of the river. 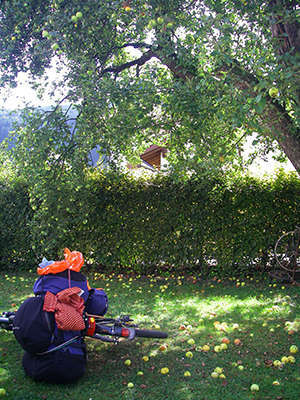 Maria's basket on the front handlebars was very useful for carrying our lunch and other purchases. Next time I will fit one to my bicycle as well. 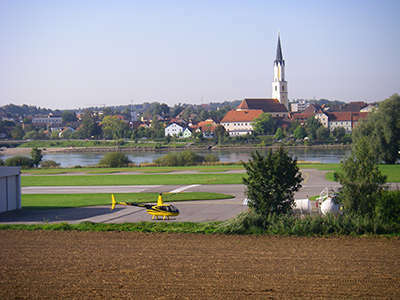 Vilshofen an der Donau can be seen on the other side of the river. The clothes were drying nicely by this time! We had reached the 2250 km mark, the distance from this point to the entry of the Donau to the Black Sea. 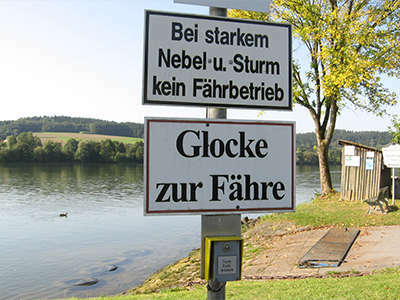 The sign is on tall posts so that it can be easily read by the river traffic. The roads and radwegs are well signposted. 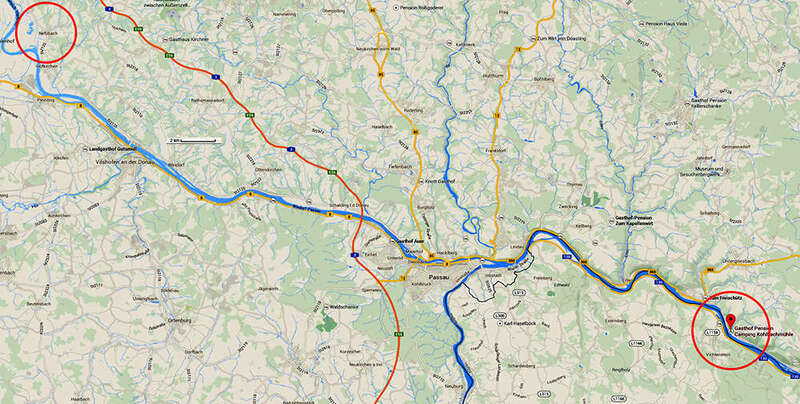 The radwegs are actually a whole network of local cycle paths that have been joined to make a contiguous whole. Windorf was just three kilometres away at this point. 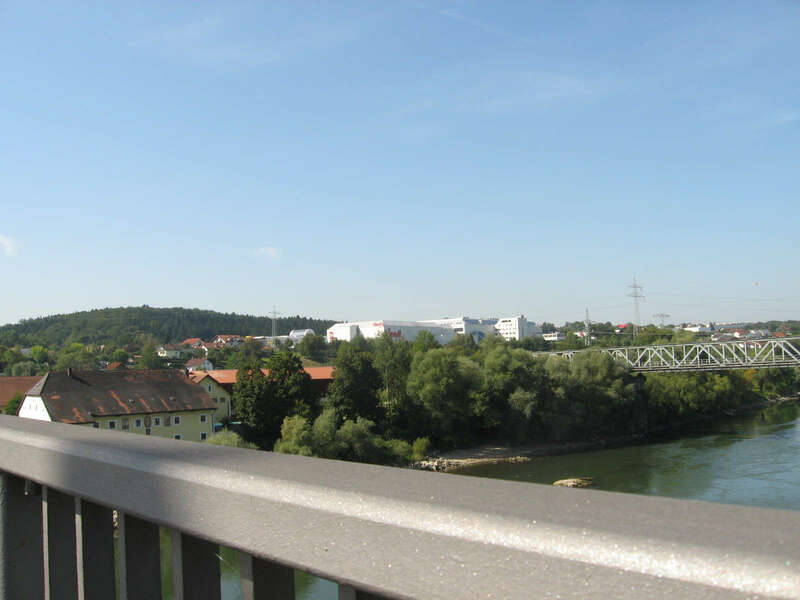 We passed Vilshofen on the other bank but decided not to cross over although there is a Radweg on the other side. 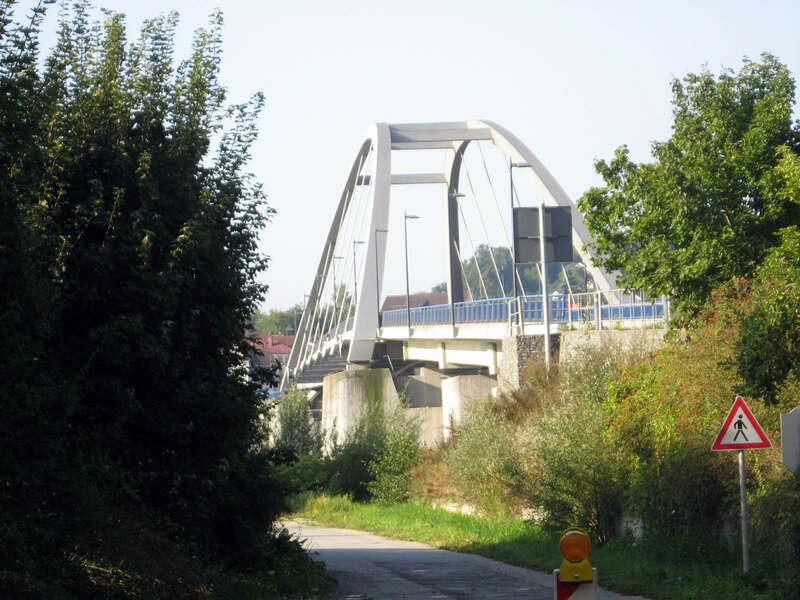 We had to cross the main road leading to the bridge and this was a bit tricky as there were roadworks happening and it was dangerous getting past the machinery. There is a small airfield just past the bridge and we stood for a while watching a helicopter take off. 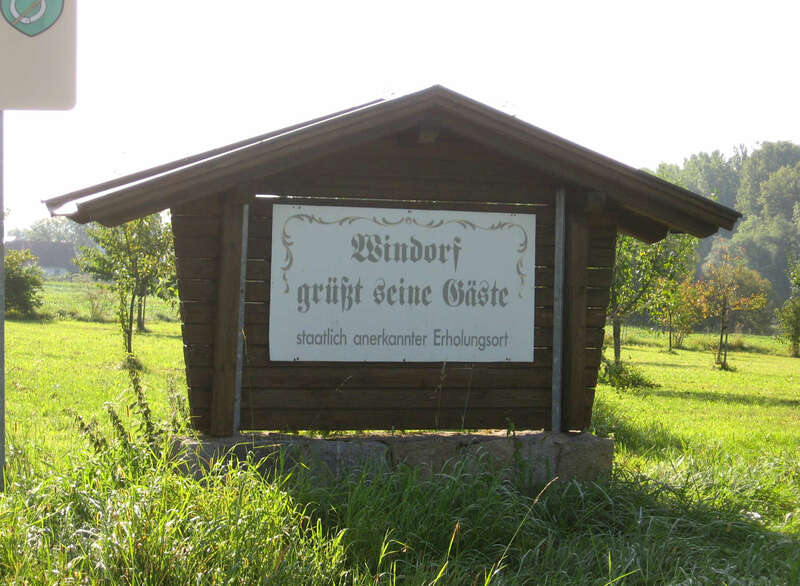 Then we continued on a good path towards Windorf. We had a bit of trouble getting past the roadworks at this point. 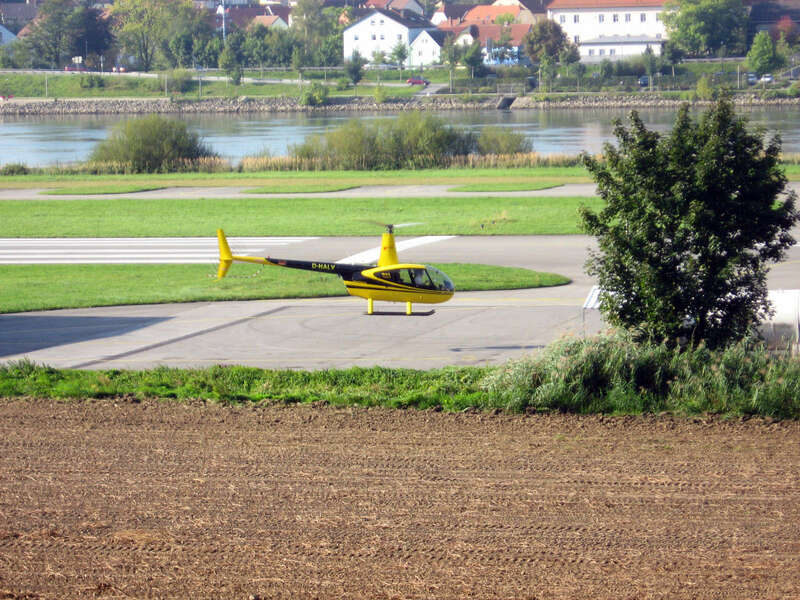 This helicopter took off as we passed by. 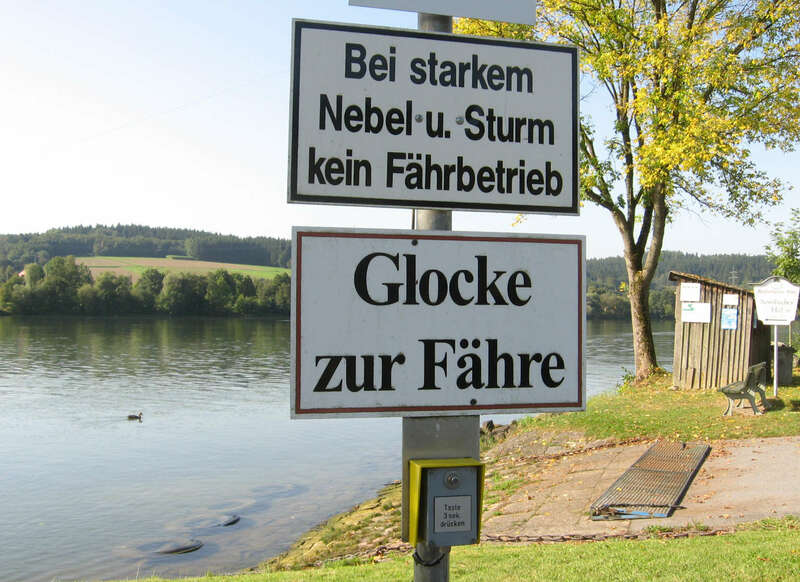 Some towns and villages had an elaborate sign such as this at their border. 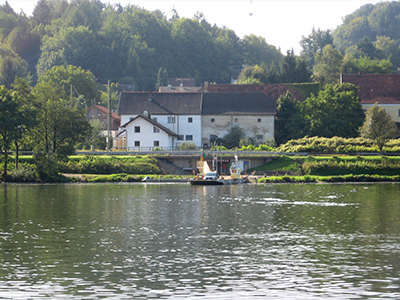 Soon we reached the ferry landing and took some photos. 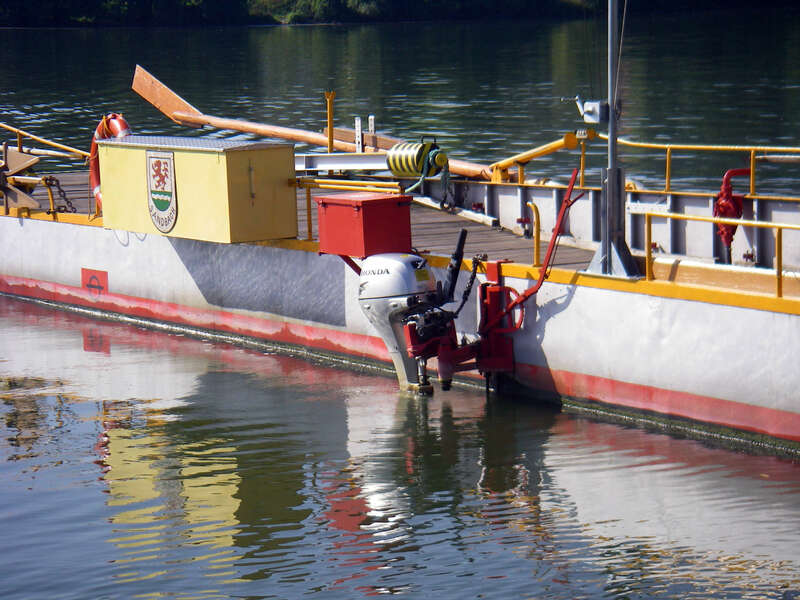 We watched the small car ferry powered by an outboard motor come across. You had to ring a bell to alert the driver. 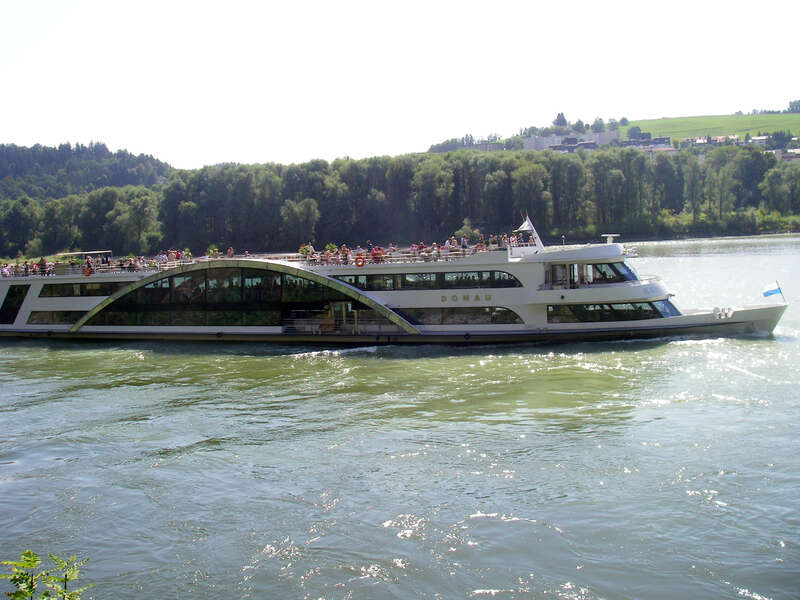 These ferries are fairly common and they charge a small fare. They are only operational from the middle of March to the middle of November. 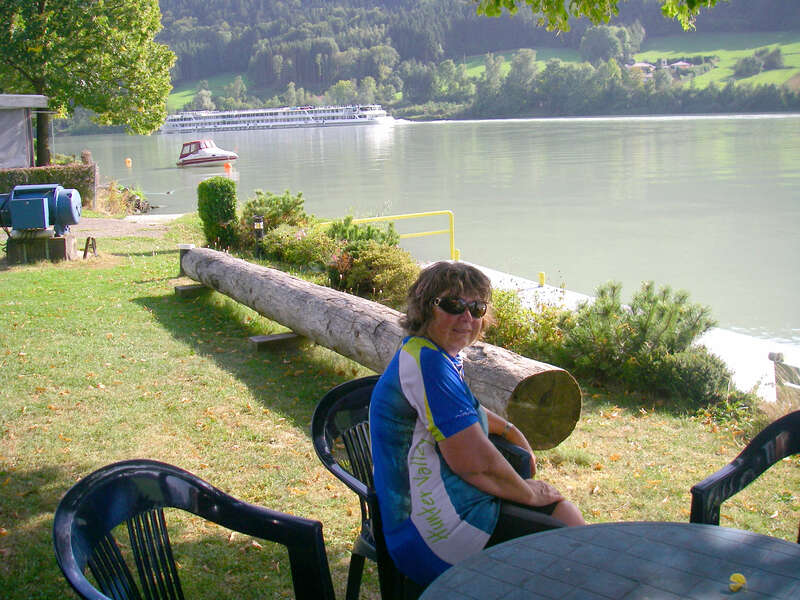 By now the day had fined up and it was a pleasure riding along the river. The ferry was on the other side when we got there, but a traveller could press the button to ring a bell on the ferry to get it to come and pick you up. 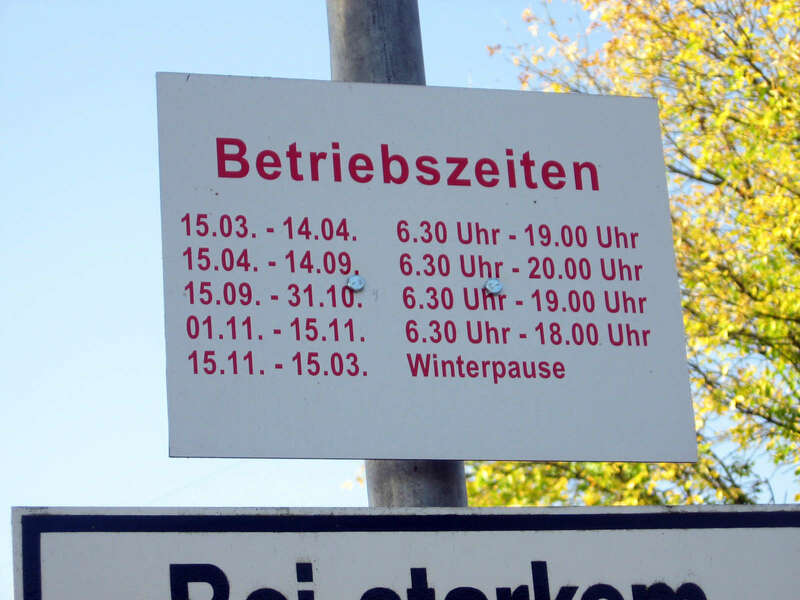 Otherwise there were fixed times when it would come over in any case. 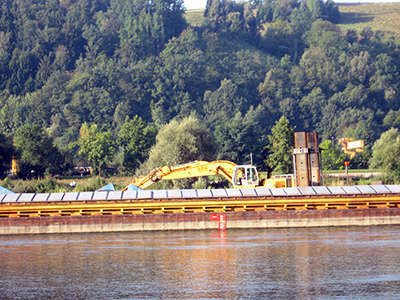 It did not cross the river during the winter months. Ducks hung around the crossing, probably in order to pick up food from travellers. 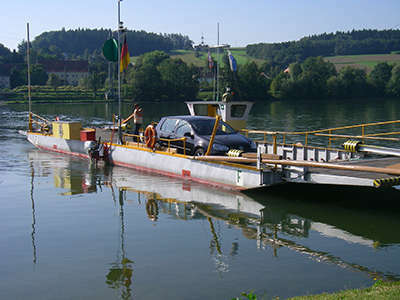 The car ferry was powered by a small outboard motor. This part of the radweg along the roadway past Gaishofen was really well made. 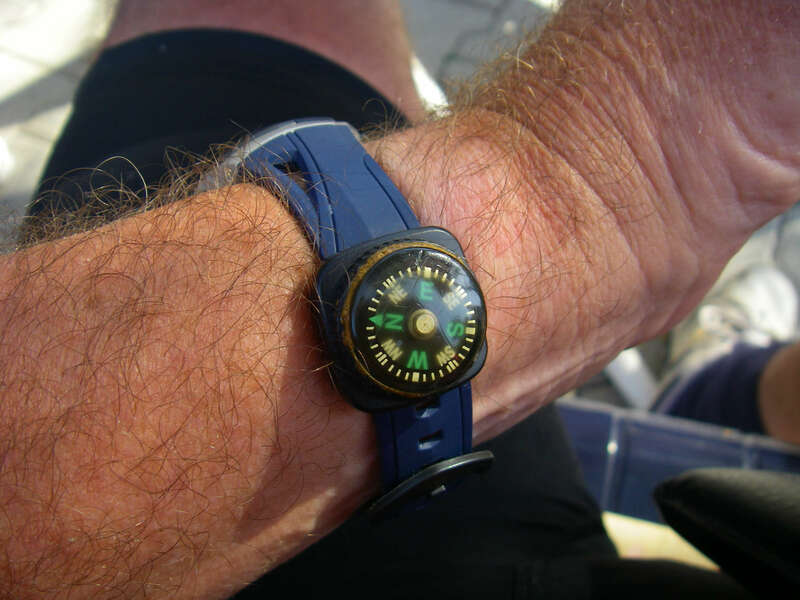 Don carried a compass on his wristband at all times. This proved to be invaluable as there were times when we couldn't decide which way to go. Reading the sky was difficult for us as we are used to southern skies. Finding north nearly always put us 180 degrees out, so we headed west instead of east! Even when it is cloudy, you can often tell where the sun is. In the southern hemisphere, the sun is in the north, but here it is in the south. Instinctively you look at the sun and decide which way is north, and act on that. We never did succeed in convincing our instincts that this was now reversed! 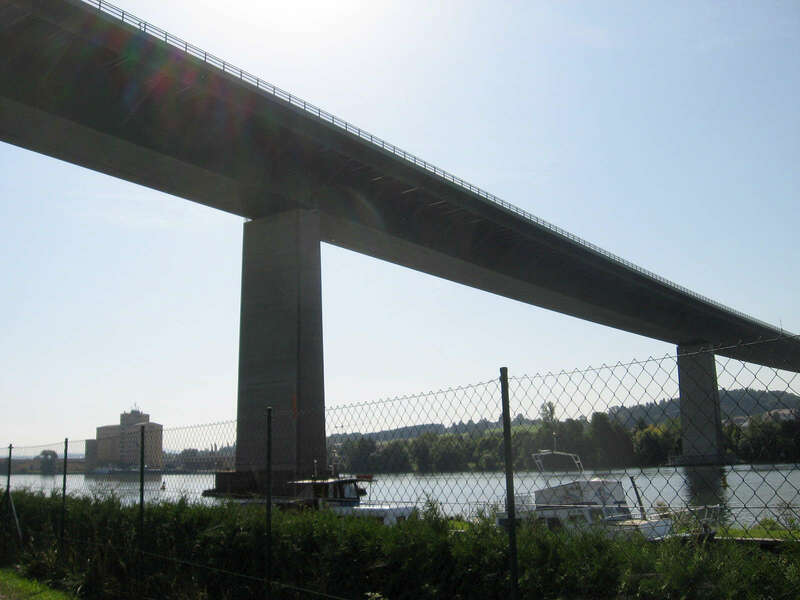 We continued along the excellent track which ran alongside the roadway past Gaishofen and under the highway bridge near Schalding. 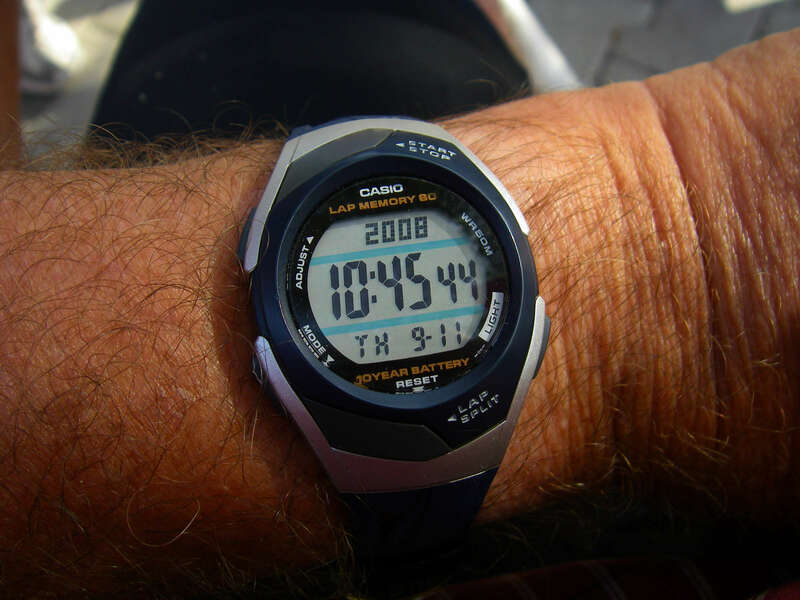 My bushwalking watch died along the way, so I bought this one, also waterproof, and attached the compass to the wristband. I always carry a compass on my bushwalking watch. It is invaluable in the northern hemisphere, since the sun is in the 'wrong' place. You unconsciously work out which is north and south by the position of the sun, so east and west, north and south were out by 180° all the time! 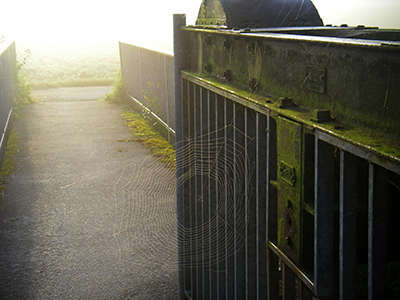 I took the photograph partly to ensure that I knew what the 'real' time was on my photographs when I got home. For reasons which I cannot fathom, the Exif data was interpreted correctly by photoshop, but the finder and preview translated it as being one hour earlier than the correct time. Under the huge overhead bridge near Schalding. 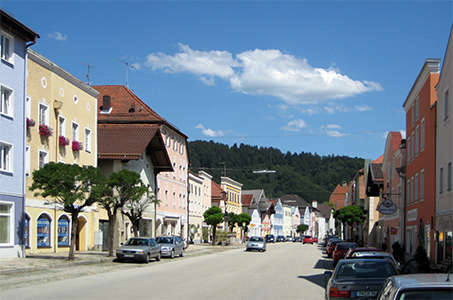 We got to the outskirts of the little village of Wörth at 11:19 am. The Donau has electricity stations along its length. 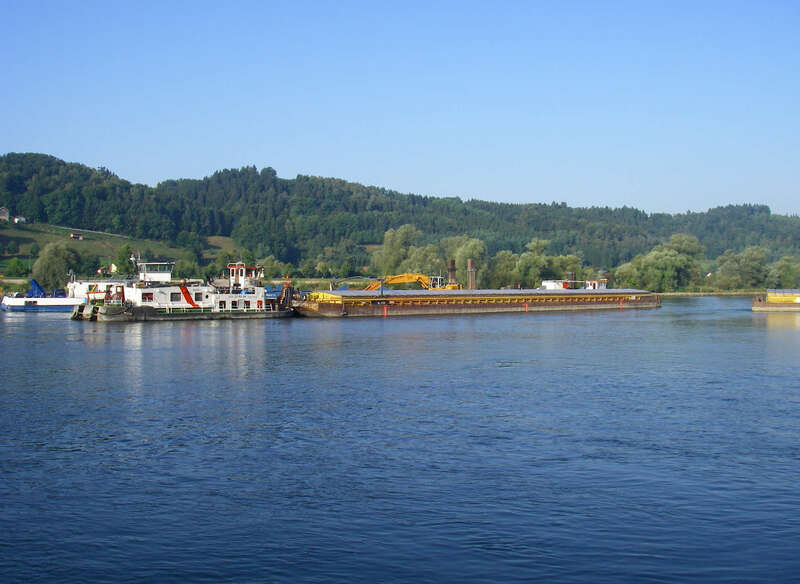 Here there is a lock so that ships can pass up and down the river at the site of the Kraftwerk Kachlet, at 2234 km from the Black Sea. Looking upstream to the Kraftwerk when crossing the bridge to Steinbach on the right bank. We rode along the good cycle path to Woerth and soon we were nearing the outskirts of Passau where we found a cafe and had coffee and cheesecake. 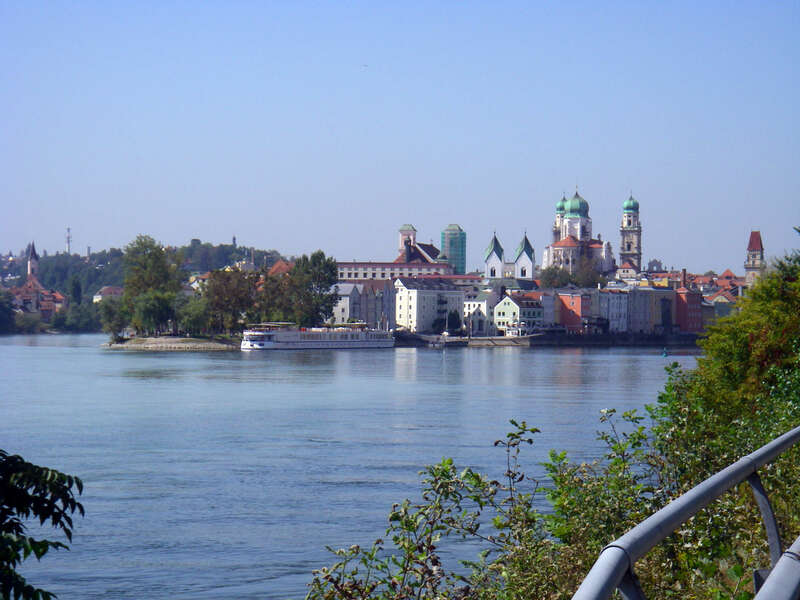 We had decided to cross over to the city to get some postcards as we've had very little opportunity to buy any along the way. 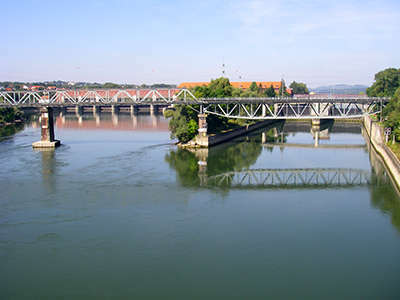 There are several bridges across the river and we took the F.J. Strauss Bruecke. 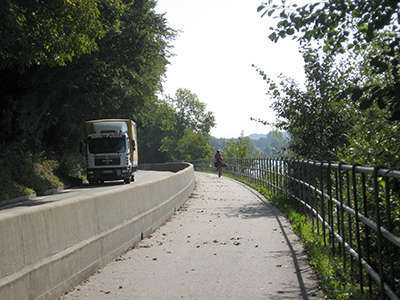 It was a bit tricky finding the Radweg over the other side as it seemed to run along the roadside but there seemed to be another track right on the river bank. We took a wrong turn and ended up on a dead-end peninsula. 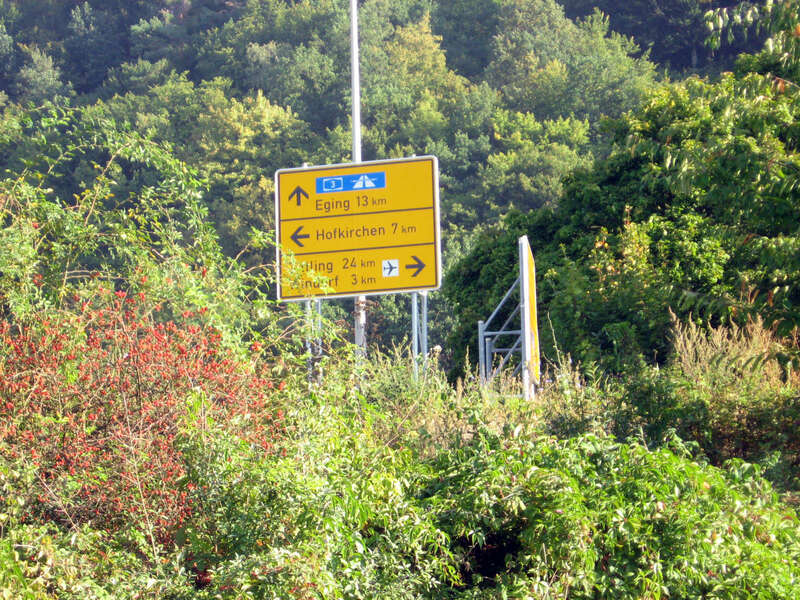 We turned around and followed the main road again towards the town. Along the way we came to the cruise boat wharf and there were small tourist shops nearby where I bought my postcards. This was excellent as we didn't need to go into the centre of town. We then crossed the river to the left bank again. 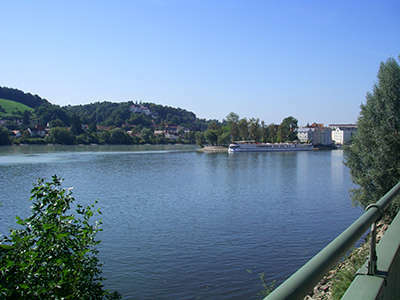 The outskirts of Passau, looking back at it from the left bank. 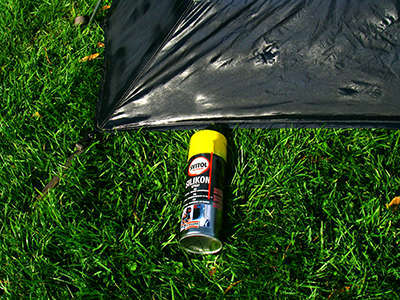 Along the way I found an auto accessories store and bought a can of silicone spray, the base of the tent was not as waterproof as it should have been, and a small amount of water was showing up in the morning at the foot of the tent from the night time dew. 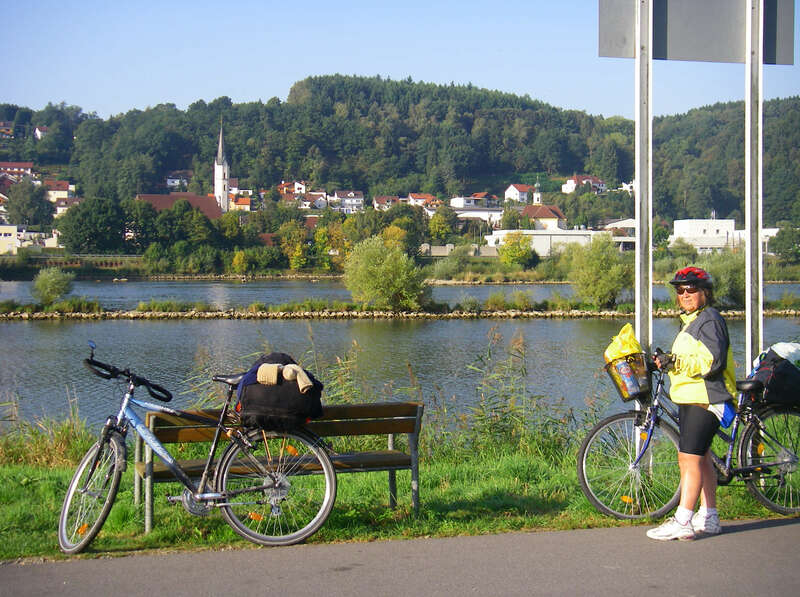 There was an excellent cyclepath along the left bank to Erlau and we had some nice views of Passau along the way. Cruiseboats and barges were plentiful and it was a most enjoyable ride. 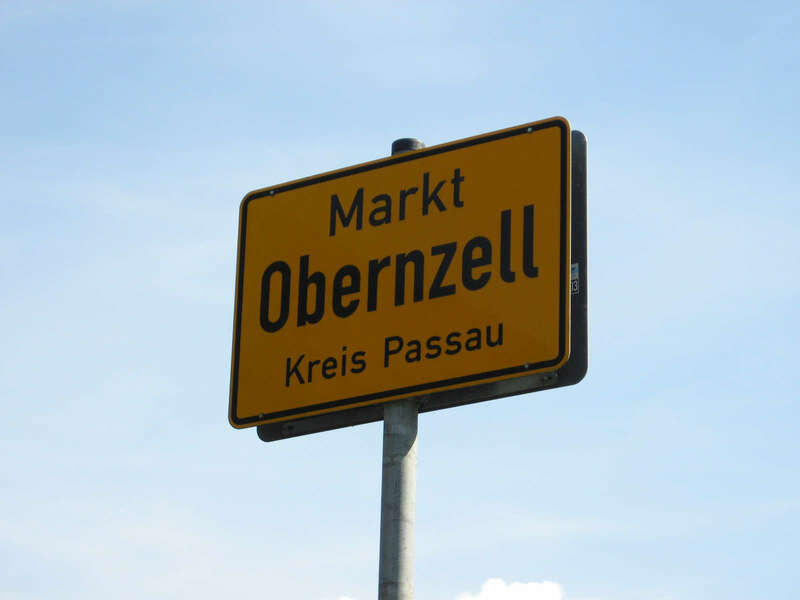 We rode through Erlau and headed towards Obernzell. 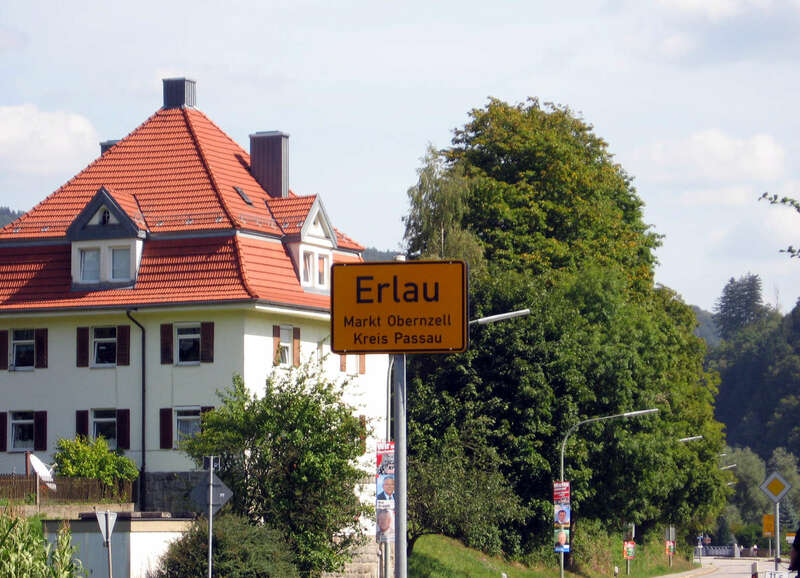 On the road to Ergau. 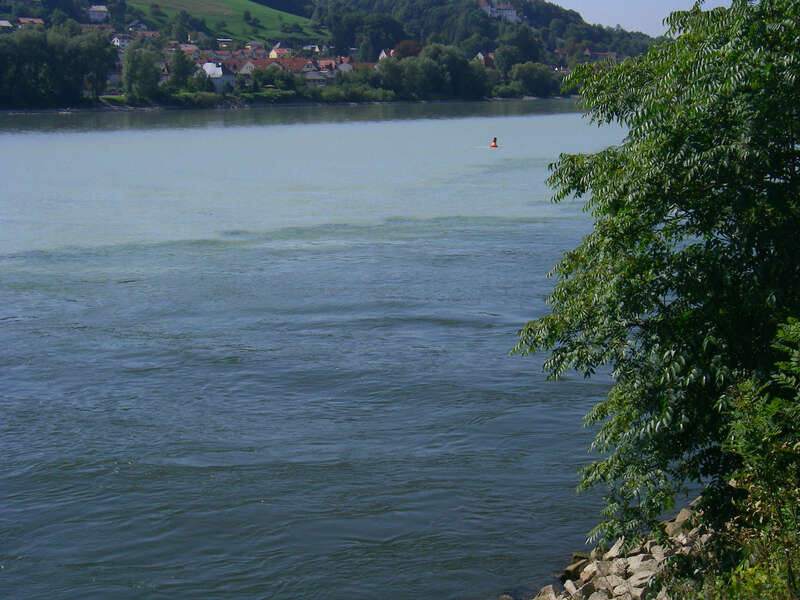 Here the darker, cleaner water of the Donau meets the murkier water of the Inn. Although the Inn has a greater average flow than the Danube when they converge in Passau, and its watershed contains the Piz Bernina also the highest point in the Danube watershed, the Inn is considered a tributary of the Danube, which has a greater length, drains a larger surface area, and has a more consistent flow. 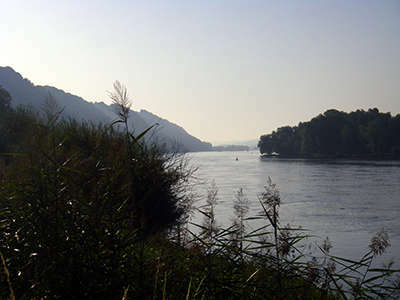 The Inn is the only river originating in Switzerland that ends in the Black Sea (via the Danube). 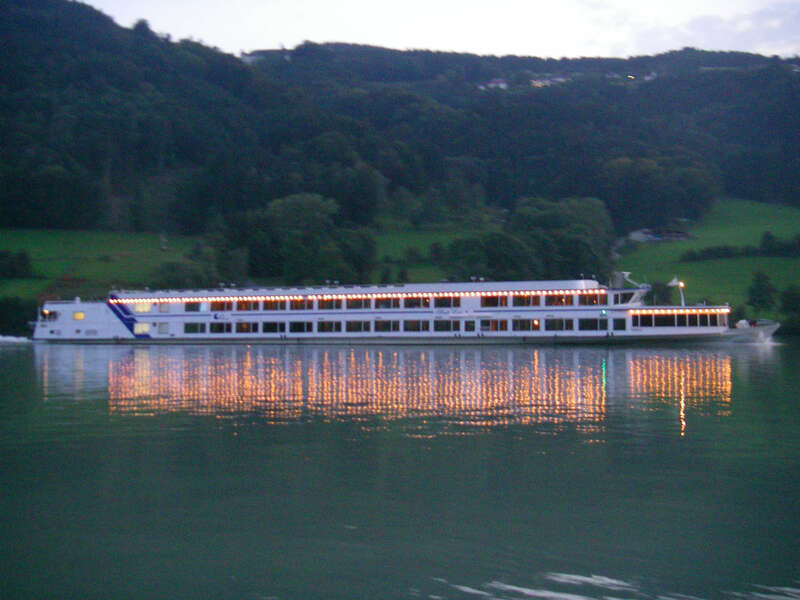 The cruise ships were now much bigger, reflecting the greater draught of water available, and the larger towns and cities now along the river. 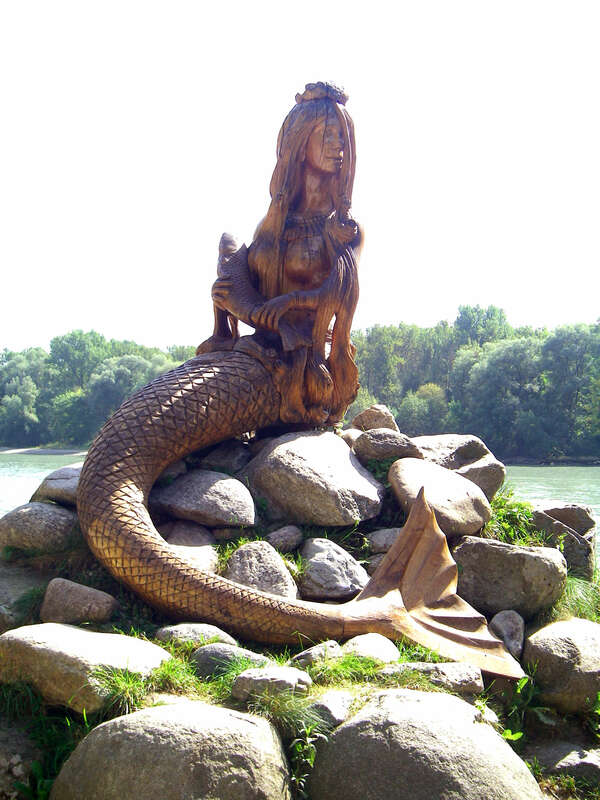 Nixe, a water sprite or mermaid. A characteristic feature of the Nixe is that they bring danger, harm and death to humans. They frequently beguile or seduce men and drag them to the bottom of rivers and lakes. 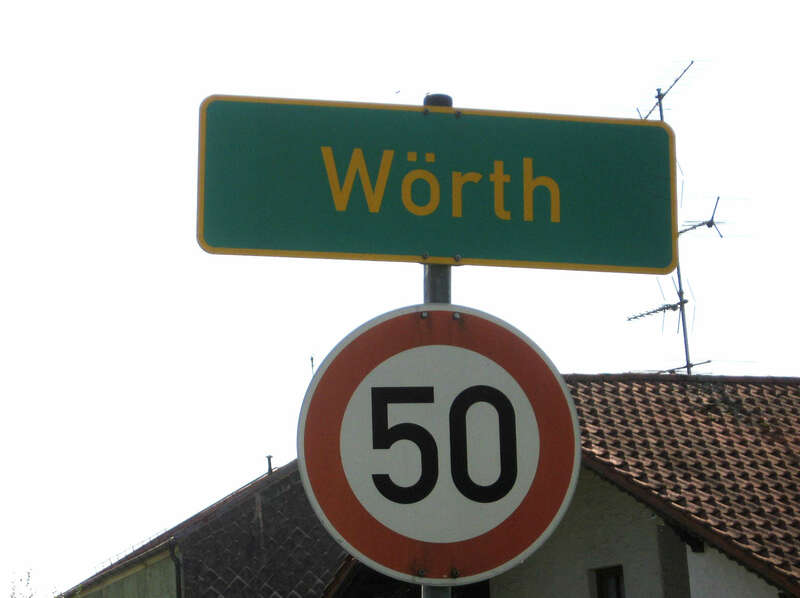 Text: adapted from the German language Wikipedia. On the outskirts of Obernzell I took a curve too sharply and the bike gave way under me. 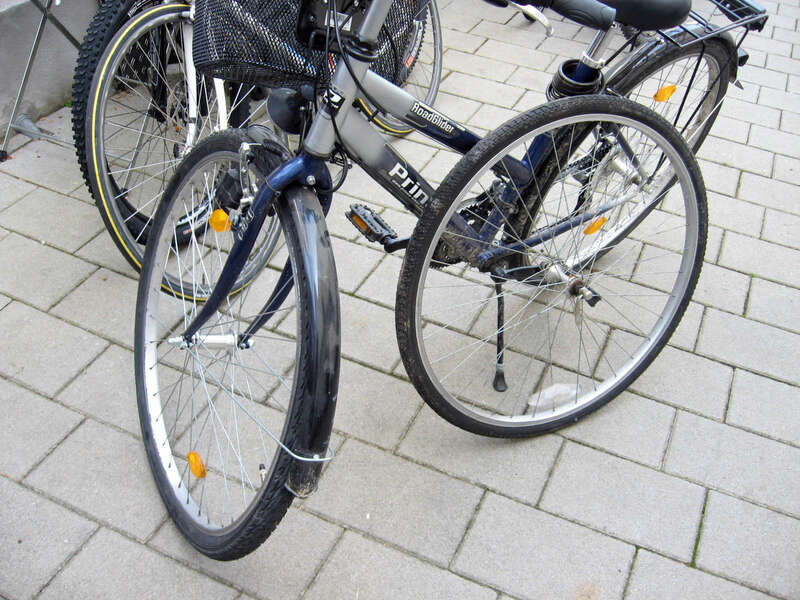 The front wheel buckled and was finished. What a disaster! The angels must have been smiling that day because about 100 metres down the road into the village was a bike shop. It was closed for lunch so we found a garage opposite and sat on a park bench in front to eat our lunch and wait for it to open. The owner was fantastic. He found me a 2nd hand wheel and fitted it while we waited outside. 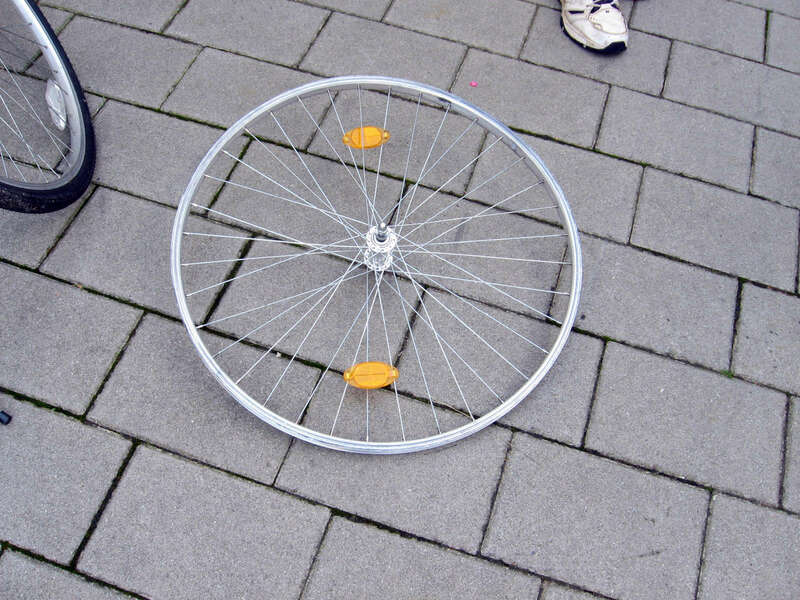 The wheel was much stronger than the original. We had travelled over 600 kms to this point in many isolated places. Then to have this accident so close to a bike shop was just unbelievable. We had planned to take a return ferry ride back to Passau from Obernzell but ruled this out as it was important to get to the campsite in one piece. The owner was fantastic. He found me a second hand wheel and fitted it while we waited outside. The wheel was much stronger than the original. We had travelled over 600 km to this point in many isolated places. Then to have this accident so close to a bike shop was just unbelievable. We had planned to take a return ferry ride back to Passau from Obernzell but ruled this out as it was important to get to the campsite in one piece. Our campsite was not very far away so we rode on to Kohlbachmuehle. 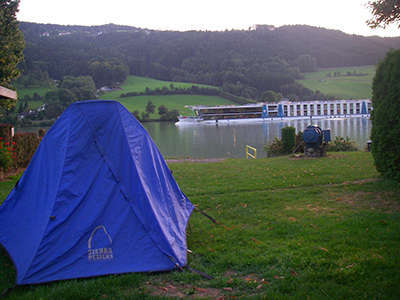 The campsite was fantastic - right on the river next to a great Gasthaus with good facilities for campers. 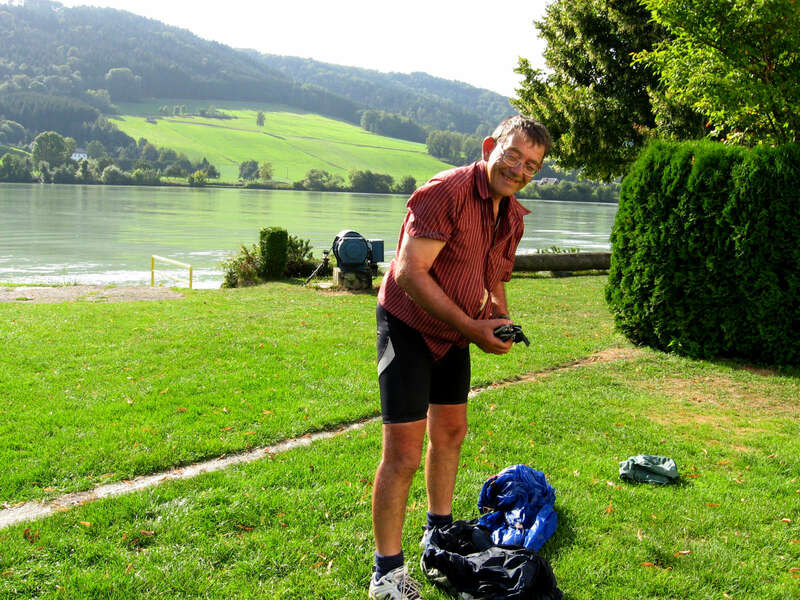 We had a beer to celebrate the new wheel and Don's flat feet (they are his lucky charm), set up the tent, showered and did the washing, wrote up the diary, waterproofed the tent and sat and watched the boats go by. In the evening we had an excellent meal (turkey strips with salad) then sat by the river till dark drinking cups of tea and being very grateful for our good fortune. 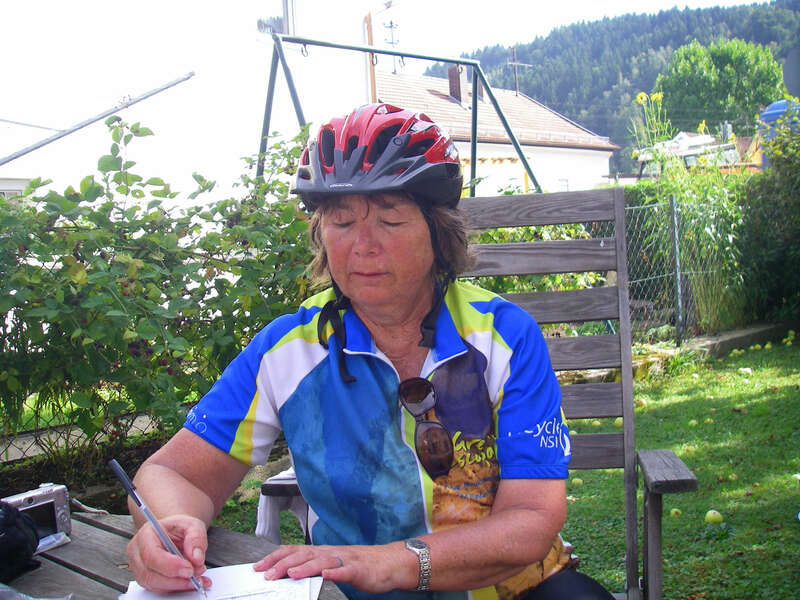 We first unpacked the bare necessities and Maria got started on her postcards straight away! I then started putting up the tent. Throughout the trip, I carried my camera and my passport and other documents around my neck, which made quite a lump at my waist, as though I had a paunch. But nobody except Maria knew who I was, so it didn't matter! I am reminded of a story about a retired couple who set up a tent beside a lake and waterfall in the north of Australia, and there was no one else there. A little car pulled up a short time later, and out got three girls. One of them said "Do you know who we are?" "Good!" they said, stripped naked, had a great swim in the lake, towelled off, got dressed, got back in the car, and drove off! 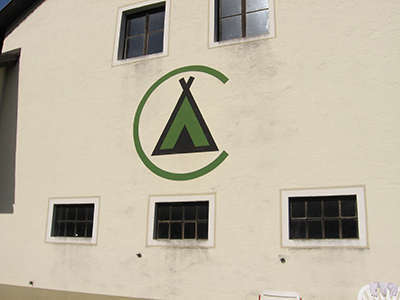 Gasthof Pension Camping Kohlbachmühle logo. 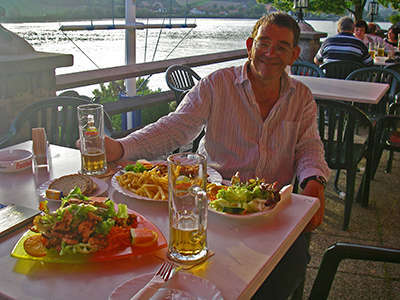 We were in an idyllic spot, with a wonderful view of the river traffic. I used the spray on the tent, and fixed the problem, as we found out later.
" This is the life! " 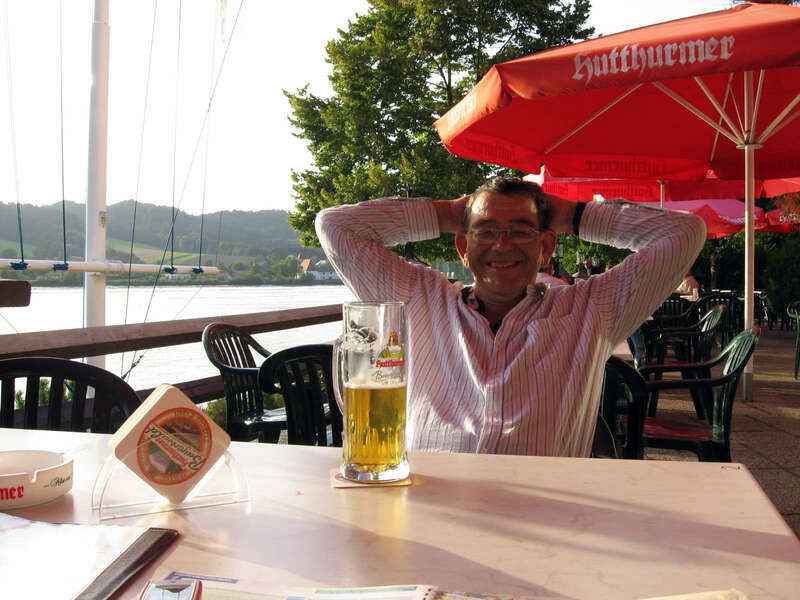 The first beer didn't hit the sides on its way down! The stonework was well done, but I would have made the piers much thicker. They look puny and unstable, not the effect you are after at all. 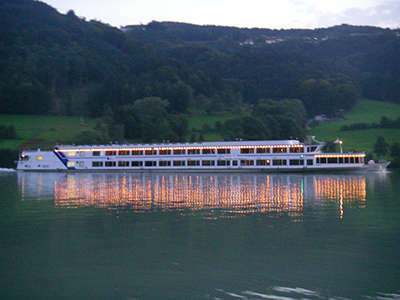 Cruise boats continued to go up and down the river in the twilight.